The KY Goldenrod crew left Nome, Alaska for the season after the first week in October. The weather had been relentless, and the visibility of the seafloor was poor. This week Dad talked with his good friend, Harold (a dredger from Iowa he met this summer), and found out that the weather did finally clear for a day or two after our crew's departure, only to be followed by yet another very powerful storm; this time carrying waves all the way to Front Street in Nome! After that storm the weather turned cold, fast! 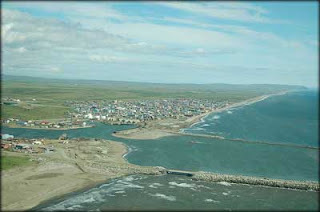 As of October 17th, 2012, the Nome Harbor had iced over. This week, port employees are going to pull the floating docks and the channel buoys out of the water. The Summer 2012 season is officially a wrap for all small dredge operations there. Our crew has a little more peace of mind about coming home a bit earlier than originally anticipated... Although, if they'd only stayed one extra day they could have witnessed the splendor of the aurora borealis (that occurred on the night of the day Mom and Dad returned from Kentucky).